Net-Tex Total Mite is an effective liquid concentrate, formulated to provide fast-working relief from fleas, lice, mites and other parasites known to cause discomfort. The multi-purpose liquid insecticide also cleans and disinfects while killing harmful bacteria and viruses, including e.coli and salmonella. The formula is effective on all common surfaces as well as penetrating deep into cracks and crevices known for harbouring parasites. A concentrated (dilute 10:1) and fast working insecticide with rapid knockdown to kill mites, fleas, lice and other flying insects. To be used on poultry houses, arks, coops, outbuildings etc. Penetrates deep into cracks, crevices and corners which parasites use as harbourages. 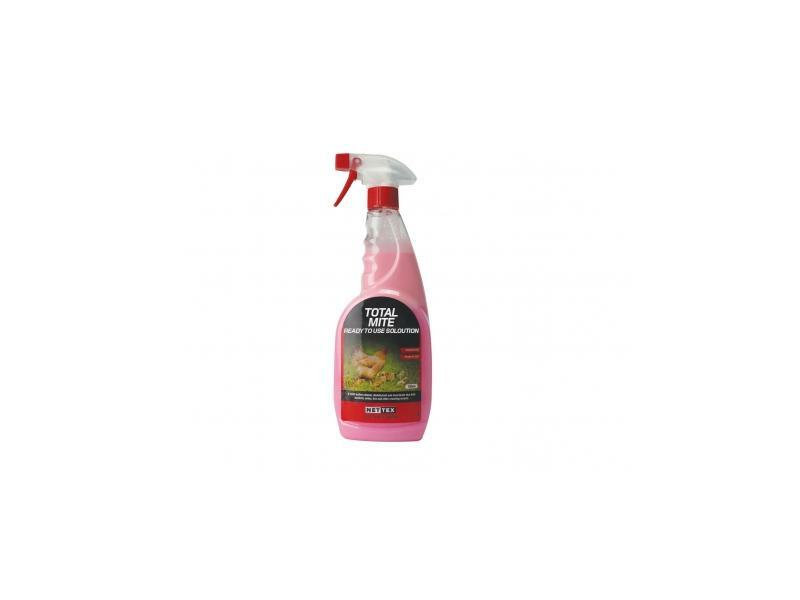 Contains a range of disinfectants to kill bacteria, yeast and fungi such as E-Coli, Salmonella, Listeria and Ps Aeruginosa. A natural, non toxic mite control powder that can be applied directly onto all types of birds and poultry. Containing silica shelled fossilized diatoms, its killing action works mechanically on the surface of the pests, breaking down their waxy protective coating, causing them to dehydrate and die. Effective against red, delumping, northern, cyst and spider mites and other insects such as cockroaches, ants, silverfish, termites and other pests such as fleas, lice and ticks commonly associated with domestic pets. The number 1 selling mite kill product with the same active ingredients as the concentrate but already diluted back for instant use. Ideal for the smallholder with a low number of chickens. Below are some recent questions we've received regarding Net-Tex Total Mite, including answers from our team. Can this be used on horses? This product is directed for the treatment of poultry only, so unfortunately we cannot advise if it would be safe for your horse. Your vet should be able to advise appropriately if your horse has a problem to treat. As this is licensed for poultry houses, arks, coops, outbuildings etc, I would be unable to advise if it is safe to use on a mattress. I have been told that DE can be used on dogs for harvest and or millennium mite control. Is this correct and is this in liquid or powder form? This product is directed for the treatment of poultry only, so unfortunately we can't advise if it would be safe for your dog. Your vet should be able to advise appropriately. Sorry we couldn't answer your question today. What are the active ingredients in the products that you sell to control mange mites. What are the products that will control this group of mites. The most effective yet safe products to kill mites are based on very fine particles of diatomaceous earth. These act by mechanically damaging their skin surface and killing mites by dehydration, even though they do not contain a chemical mite killer. This makes them safe for you to use, and for your poultry. It is also safe to eat the eggs of treated birds, which is not the case with products which contain toxic insecticides.